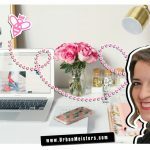 It’s “that” time of the month readers! The time we take on some green taboos and talk about re-usable menstrual options to ensure a robust and seamless zero waste lifestyle. 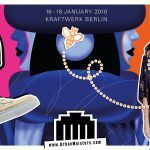 We know all you women are shaking your head in unison when your menstrual time arrives and your sanitary pads and tampons put a red light on your zero waste lifestyle. And then there are a lot of us who don’t give much thought to the environmental impact of our periods. To put some things in perspective: According to USA Today, the average woman has an estimated 500 menstrual cycles in her lifetime. Some figures put that as almost 62,415 pounds of garbage during her fertile years which is about 0.5% of yearly landfill waste! 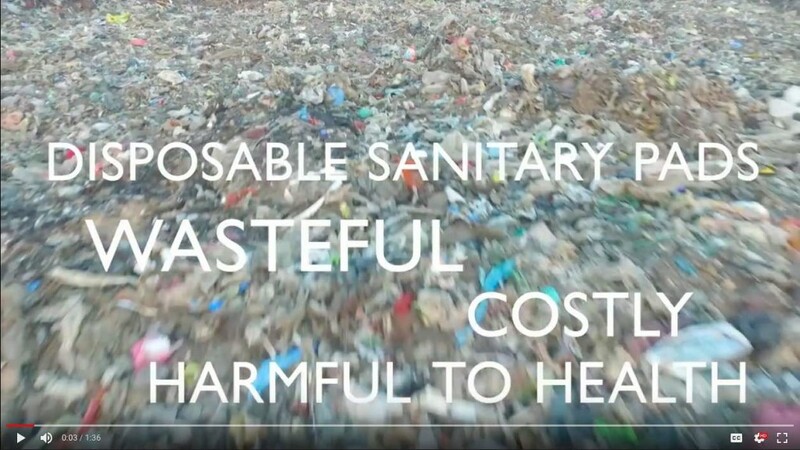 We at UrbanMeisters are constantly on the look out for sustainable options and give you hand-picked solutions for tackling the sensitive issue of menstrual waste the eco-friendly way. Earlier, we had fellow greenie and zero waste instagram influencer Jessica Burgess discuss the menstrual cup as sustainable alternative. Today we bring to you another sustainable solution- Saukhyam Reusable Menstrual Pads which are a 100% natural. Safe. Practical. Essential. Zero waste. Excited yet? We know you have a lot to deal with during periods and we don’t want to really add to that worry list. But let’s examine the footprint a bit. You wear your pad or tampon and post a few hours, THIS IS IT. It’s the dreaded time to wrap it up and throw it away. What happens after? 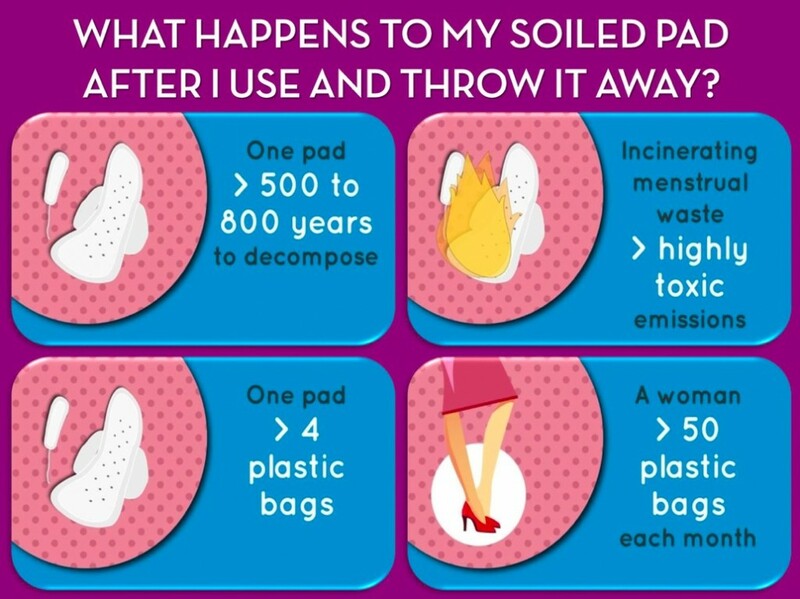 Pads takes 500-800 years to decompose and what’s worse, burning it releases highly toxic emissions. Your one pad is equivalent to 4 plastic bags. That means a single person disposes off -prepare yourselves for this- 40,000 to 60,000 plastic bags in a lifetime! Close to 20 billion sanitary pads, tampons and applicators are dumped into landfills every year in just US. Let’s take a step back further- making of ‘fluff pulp’ or the absorbent filling in your disposable pad is made by cutting many tress. Then the damage done to your pockets is up next with a substantial amount of personal care expenditure going into buying disposable pads and tampons that eventually go completely waste. Keeping in mind all of these factors there is a movement to revert to older more ‘sustainable’ methods like using cloth- some leading research facilities like the Stockholm Environmental Institute recommend it. Menstruation is the most natural and healthy albeit uncomfortable process taking place in a woman’s body. Across the globe, tampons and pads are considered our only supporters in this time, but they bleed red all over our green radars not just for environmental reasons. There is a real health risk also involved that absolutely shouldn’t be ignored. We told you about harmful toxic chemicals- dioxins– that are released when used pads are burnt. But these are always present in the pad or tampon and gets absorbed in your bodies and these are serious endocrine disruptors. Your skin is highly permeable — especially around the vaginal area. Anything coming in constant contact with your skin will land in your bloodstream and spread throughout the body. An endocrine disruptor (ED) is a foreign substance or mixture that alters function(s) of the endocrine system, consequently harming an individual life form, its offspring, or populations. Pads contain dioxins as a by-product of bleaching and dioxins are EDs known to have links with reproductive issues and cancer. In fact the WHO says that dioxins are carcinogenic even in trace amounts. Dealing with menstruation the green way is a global battle and we’re constantly bringing you the best zero wastage solutions from around the world. We hit jackpot with Saukhyam re-usable menstrual pads made by Mata Amritanandamayi Math- an NGO in India with consultative status to the United Nations. 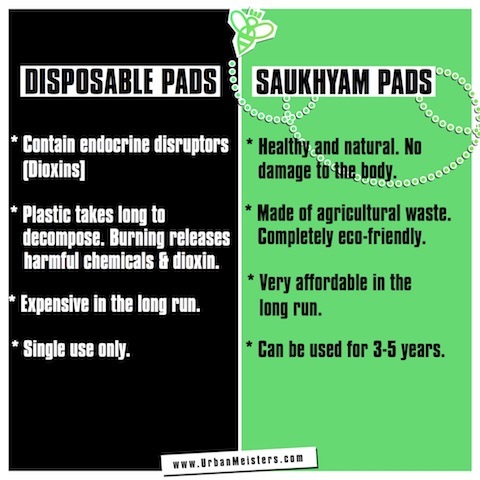 No greenwashing- Saukhyam Re-usable Menstrual Pads are made by a world renowned and UN recognised NGO so no question of their authenticity. Practical and pocket friendly because we’re anyway used to sanitary pads and these just last way longer. They’re easy to clean and re-use. Look really cool! Surprised about this? So were we! 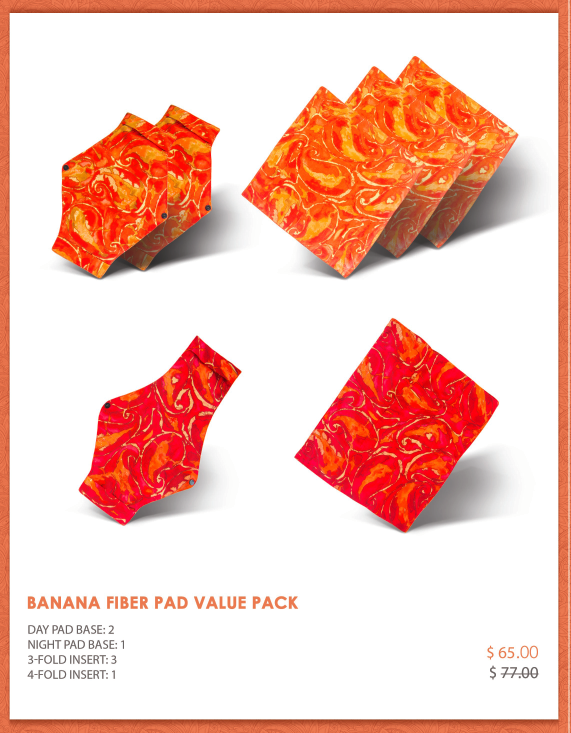 These re-usable menstrual pads come in beautiful colours and patterns making it a happy period definitely! 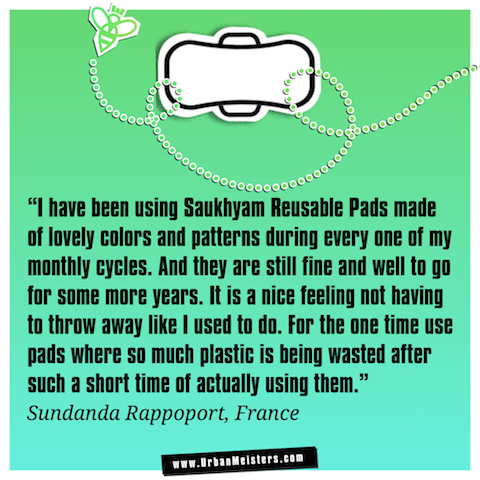 Why are Saukhyam Re-usable Menstrual Pads sustainable and eco-friendly? The filling- which is the absorbent feature- is made from banana fibre which is a naturally occurring absorbent material. This fibre can absorb upto 6 times it’s weight in fluid! 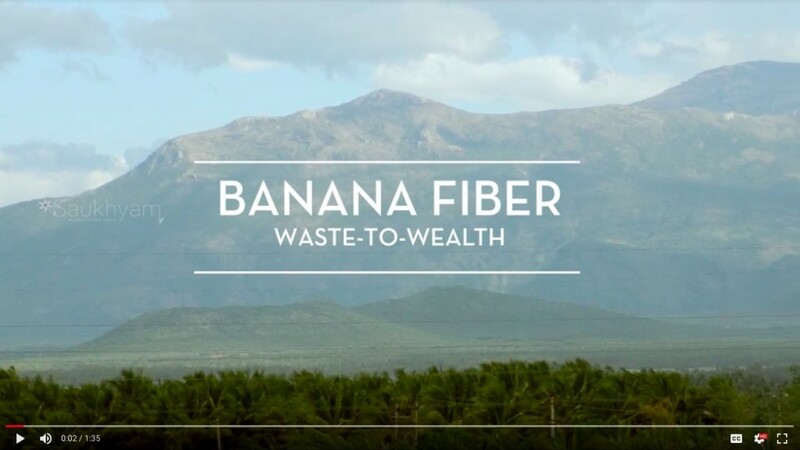 That’s a fabulously renewable material and India is the largest producer of bananas in the world! It’s also plentifully available as agricultural waste in several countries of the world. Saukhyam uses banana fiber for enhanced absorption. They are reusable and easy to wash and dry. With proper care, they can last at least for 3-5 years. 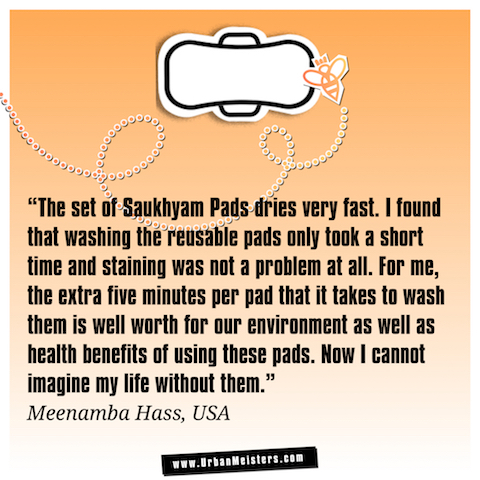 What are the functional features of Saukhyam Re-usable Menstrual Pads? 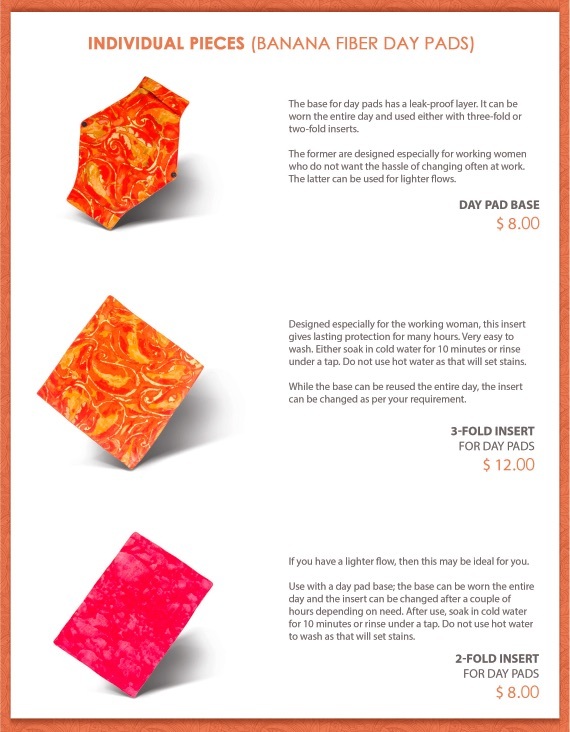 You can find varieties of Day Pads, Night Pads and value packs for heavy flow, light flow or when you do not want the hassle of changing often at work. 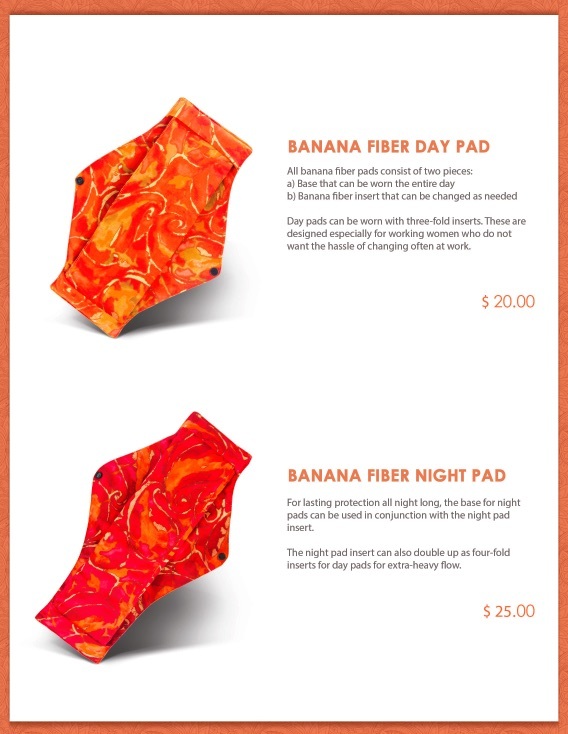 There is also a night pad insert for 100% night protection and can also be used as 4 fold insert for heavy flow. There-usable menstrual pads can be washed either by hand or in the washing machine. First, soak the soiled pads in cold water for 10 minutes. Or rinse under a tap. After this, wash the pads just like you would wash any of your other clothes, either by hand or machine. Make sure you hang up the pads to dry in sunlight or use a dryer. Once washed and dried, the pad is ready for use again. All in all Saukhyam re-usable menstrual pads are a healthier choice, better for the environment and costs less in the long run. Win-win we say!